It's not as bad as the Dr Who/Football hero slogans as these are being used in IMPs to ALL addresses not just the home towns of the finalists. But one slogan a day is still a ridiculous situation! Thanks as always for keeping us up to date. You think the slogans are used on mail addressed to the areas they live. Does the full addresses of the copies you hav seen indicate this? 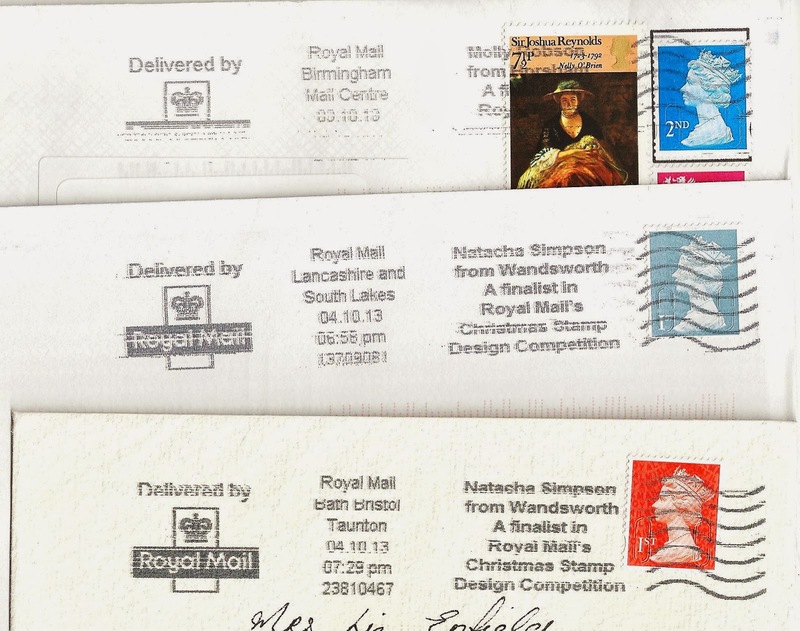 The Royal mail announcement says they will feature on mail addressed nationwide. Have you seen any on your inward mail or is the RM announcement just wrong? Tia is from Bamber Bridge. I notice from the illustrations that RM have a strange idea of one a day as the Natacha ones are dated 4th and 5th and there are two different ones dated 9th. My copy of the Tia Dann one is from Bristol dated 8th! I think the 'answer' regarding the 4th Oct slogan also being used on 5th is that much less mail is posted on Saturdays (such as 5th Oct), and indeed some Mail Centres do not process outward mail - e.g. Preston's mail goes to Manchester on Saturdays, and Medway's and Croydon's mail goes to Gatwick. Yes, it's Tia Dann from Bamber Bridge, near Preston. It's stretching the point to say all IMP-processed mail is receiving the slogans - though that is the intention. I've had several recent letters, posted in Preston to Preston, with stamps uncancelled, or with only wavy lines cancelling the stamp. This was despite my taking care to use only current Machin definitives, as I know IMPs can be picky and often fail to cancel older issue or Post & Go stamps. Niall Conn from Armagh dated 10th from Lancashire and South Lakes. I'm sure others would like to see the two Northern Ireland postmarks so if you can send scans to me I'd appreciate it. Olivia Heller from Royal Tunbridge Wells appeared on 7 October - I have this from Preston Mail Centre ('Lancashire and South Lakes'), also used late - presumably in error on 8 October from Romford Mail Centre. The previous day's slogan may appear early in the day, before the due changeover time, but the Romford one is timed 03.59pm.